Released amidst heavy expectations, Gunasekhar’s ambitious historic 3D drama, Rudhramadevi, collected a huge 9.17 crore share on its first day in AP and Telangana alone. In the US, the film raked in close to $300K, including the Thursday premiere shows. The film’s dream run continued even on its second day and it is set to collect anywhere close to 4.5-5 crores in Telugu states. The film crossed the half million dollar milestone in the US on Saturday. With the Sunday advantage in India and Monday being a holiday in the US, Rudhramadevi is all set for a whopping first weekend collections. Already, all the Sunday shows have been sold out in most areas, showcasing the film’s craze at the box-office. Family audiences are patronizing the film big time and the film’s ensemble cast and the stunning 3D experience are said to be the major attractions. 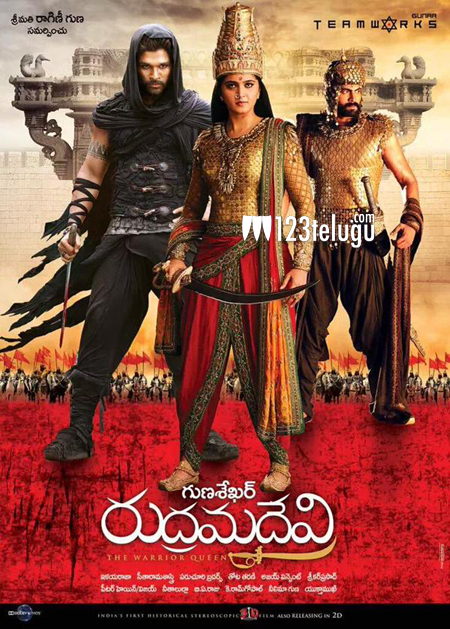 Rudhramadevi is India’s first historic stereoscopic 3D film which is made with a mammoth 80 crore budget. Anushka’s majestic performance and Allu Arjun’s Gona Ganna Reddy character coupled with the historic legacy of Kakatiya Kingdom are enthralling the audiences big time.